Four Australians who were found guilty of vandalism for removing a brass sword from a war memorial told a court that their actions were inspired by Pope Francis, referencing a message in which the pontiff said that religion cannot be used to justify war. 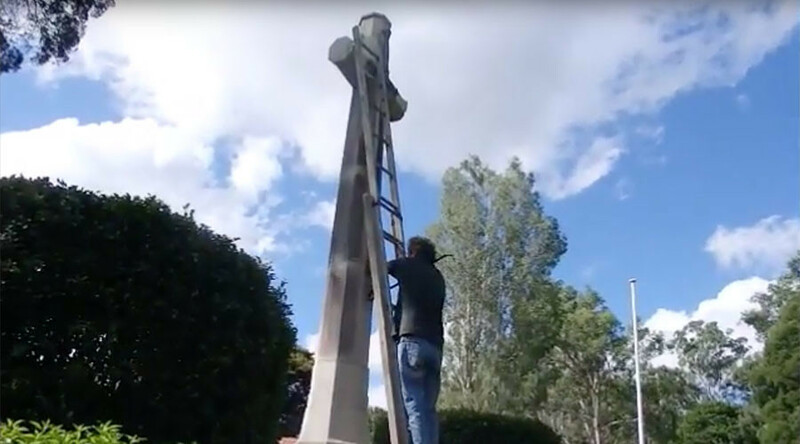 The men were convicted on Monday of vandalizing the memorial – which consists of a stone crucifix and a brass "sword of sacrifice" – in Brisbane's Toowong cemetery on Ash Wednesday, March 1. One of the defendants, 61-year-old James Joseph Dowling, told the Brisbane magistrates court ahead of the Monday ruling that Pope Francis had "influenced" them to remove the sword from the monument. 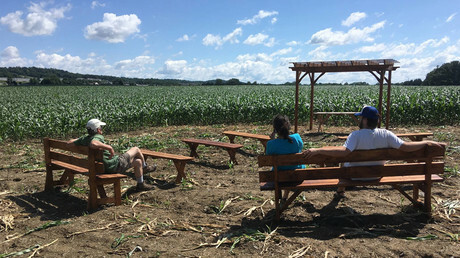 “We were influenced by Pope Francis’s words...where he said religion can never be used to justify war, and peace alone is holy,” Dowling said, as quoted by the Australian Associated Press. Dowling said he and his partners in crime "had nothing against the memorial," but wanted to make it better by removing the sword and using an anvil to transform it into a garden hoe. “We didn’t set out to destroy or damage it, we wanted to transform it and improve it, which is what we did,” he said. The 61-year-old admitted that he came up with the idea and drove the group to the cemetery. He said he brought the necessary tools, along with banners which displayed religious verses. He and the men sang a hymn as the sword was removed. However, Dowling denied being the group's ringleader. Last week, the court viewed a series of short clips and pictures, which showed Dowling and accomplice Tim Webb removing the brass sword. 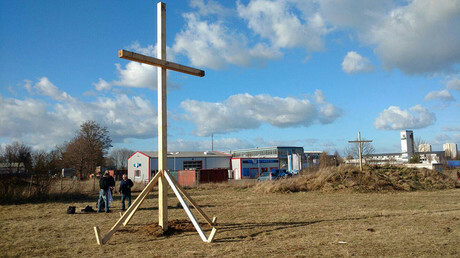 The footage showed Dowling scaling the cross, cutting the 1.8 meter sword free with a hacksaw after he failed to remove it with a crowbar. Webb is then seen using a mallet and anvil to beat the sword into a plough shape. Speaking to police on the day of the incident, Dowling admitted to removing the sword. When asked whether he was authorized to do so, he said he had "higher permission." Dowling and Webb were accompanied at the scene of the crime by Dowling's son Franz and a man by the name of Andrew Paine. All of the men are reportedly members of the Catholic Workers Movement. Following the Monday verdict, Dowling and Webb were ordered to pay AU$17,812 (US$14,155) in repairs between them, the Brisbane Times reported. Dowling also received a three-month jail term, suspended for three months, and was ordered to complete 100 hours of community service. Webb also received 100 hours of community service. Paine, who video-taped the vandalism and emailed a press release informing the media of the incident, was convicted and fined AU$1,500 (US$1,192). Dowling's son Franz, who played guitar and sang hymns during the protest, was fined $1,000. However, no conviction was recorded. During the sentencing, Queensland chief magistrate Ray Rinaudo told the men that they "simply cannot do this with impunity and think you can hide behind your beliefs. It doesn't work like that." Outside the court on Monday, Dowling said their civil disobedience was simply part of a tradition dating back to Jesus Christ, Martin Luther King, and Mahatma Gandhi. "We are just carrying on that tradition, by doing something which might seem shocking but it is not the wrong thing to do," he said, apologizing to any veterans who were offended by the action.